I just became aware of three official proclamations pertaining to family reunions and thought it was interesting that there are basically three “official” family reunion month. Make your family reunion official by issuing an official proclamation. 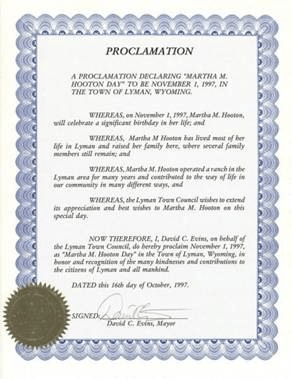 You can ask for a proclamation from your city for many reasons including the date of your family reunion. You could ask that the day of your reunion be declared, “Wells Family Reunion Day” or “Stewart” Family Reunion Day. Use a proclamation to recognize an ancestor or a special family member. Dignitaries are anxious to grant such requests especially if the family has a long history of service in the community. Some communities will even dedicate a week to your special event, cause or industry. Reads more about obtaining an official proclamation for your family reunion here. Family Reunion Month A Proclamation in 1985 To raise awareness of a growing trend of runaway children and newly formed organizations to help reunite families of runaways the Congress, by House Joint Resolution 64, has designated the period between Mother’s Day, May 12, and Father’s Day, June 16, 1985, as "Family Reunion Month" and authorized and requested the President to issue a proclamation in observance of this period. National Family Reunion Month While some commercial enterprises have dubbed August as National Family Reunion Month many social groups including churches observe National Family Reunion Month in the month of July. This entry was posted in Planning a Family Reunion and tagged family party ideas, family reunion, family reunion activities, family reunion ideas, family reunion month, family reunion plans, official, proclamations by Aunt Mo. Bookmark the permalink.